My second part of the India travel is to explore the India’s Golden Triangle, which include the three important cities. The Indian’s Golden triangle is a popular tourist circuit which connects Delhi, Agra and Jaipur. The total circuit is about 720 km each by road and each leg is about 4 to 6 hours of drive. My first leg started from Jaipur. Before departing to Jaipur, we filled our stomach with Chinese food in Delhi. After few days of Kashmiri cuisine, curry and naan in India, I was pretty glad to have the Chinese modified food in this restaurant in Delhi. 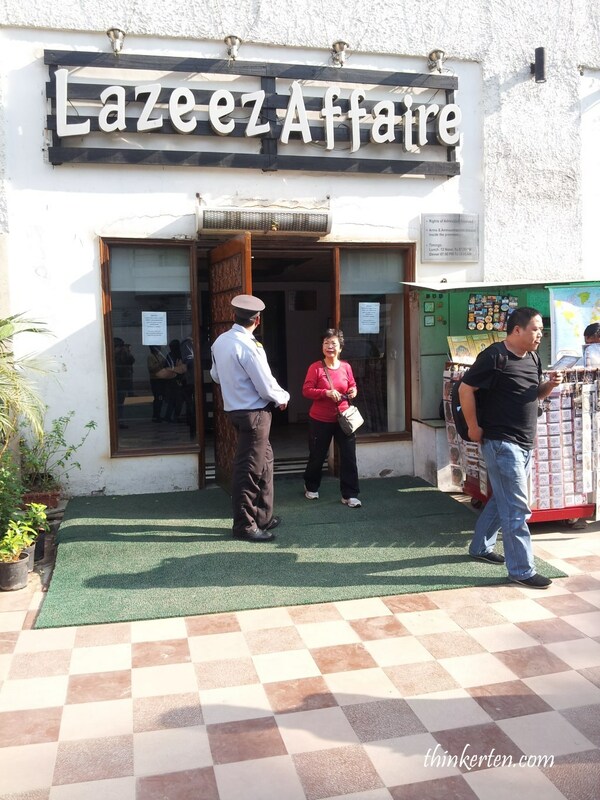 The restaurant is very popular both local and foreign customers, it serve both Indian and Chinese cuisine. The ambiance is really nice and decoration is classy but the Chinese food may not up to your expectation. Hey, what do you expect? This is India. Jaipur is the largest city in Rajasthan and it is a major tourist attraction for local and international travelers. Jaipur offers many tourist spots so staying 2 nights would still consider short to discover the beautiful forts and palaces. 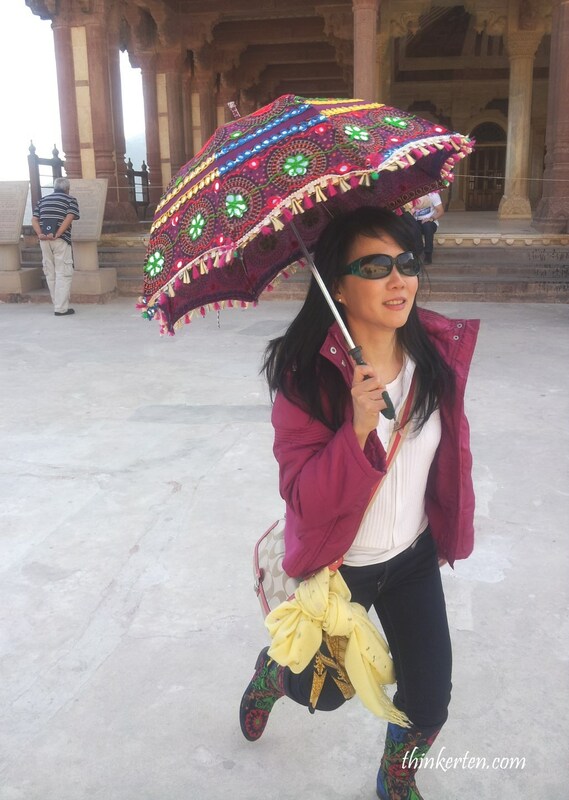 My day 1 in Jaipur has covered there important places, Amer Fort, Jal Mahal and Hawa Mahal. 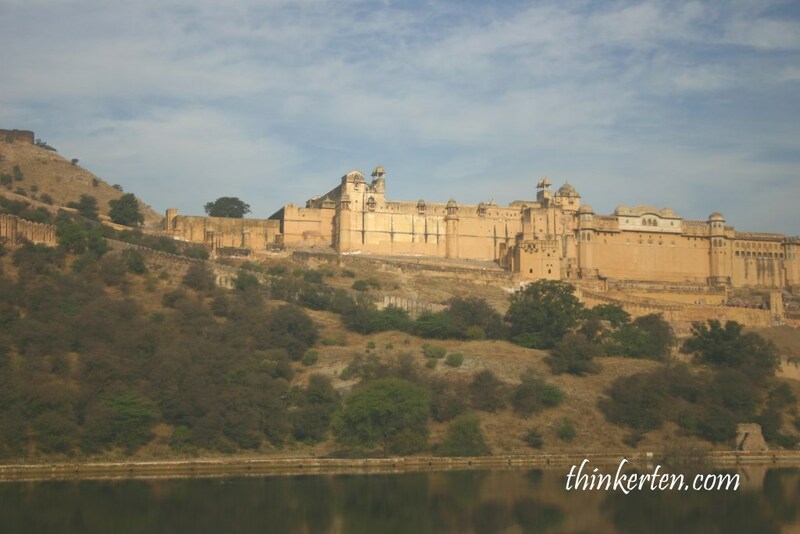 One of the must see attraction is Amer Fort which is also one of the Unesco World Heritage site. This place is big and take whole day to explore. 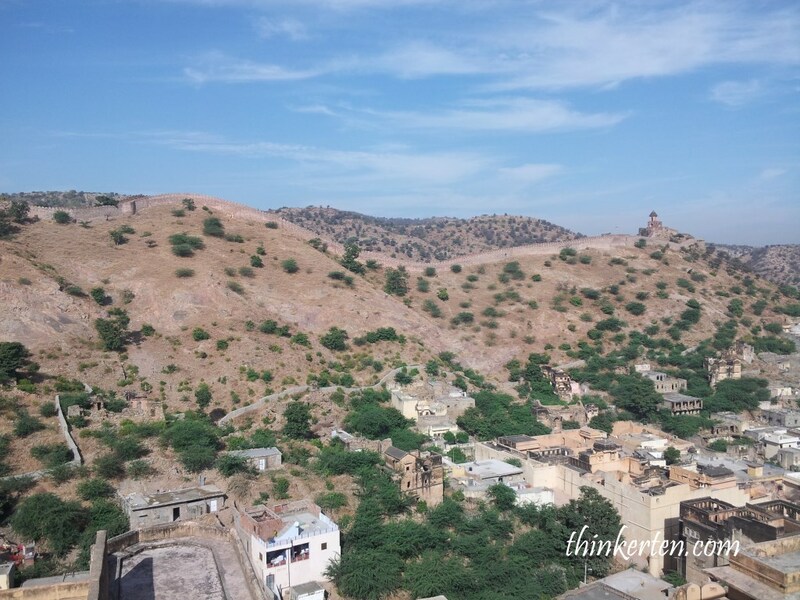 Amer Fort is about 11 km away from Jaipur, arriving early to Amer Fort will benefit you more and I shall tell you why later. The Fort is known for its artistic Hindu style elements which is located high on a hill overlooks Maota Lake. This amazing fort has never been conquered and the exterior of the fort and inside is totally different. The outer look may be a bit dull but wait till you enter the inner part of the fort. I was standing in front of Maota Lake to take the reflection of Amer Fort but I could not captured the reflection very well and it turns out like this. Opps! Elephant Ride up Amer Fort -what to watch out? 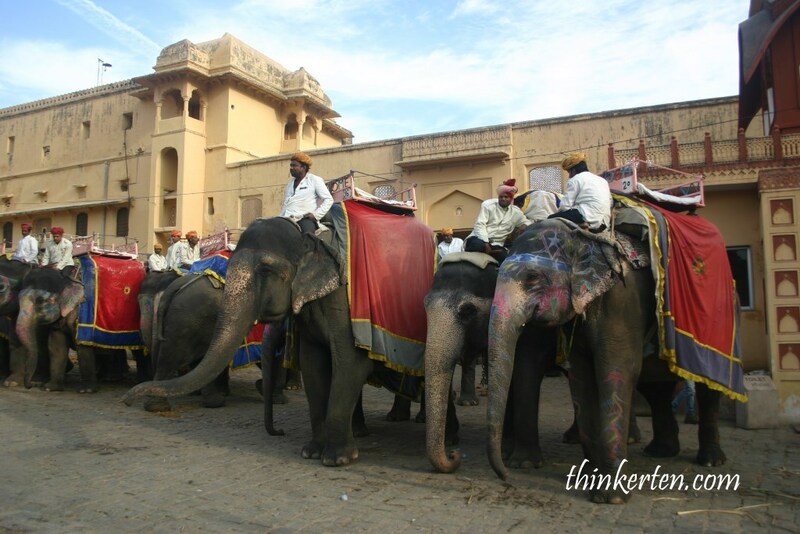 Elephant ride is one of the highlight of visiting Amer Fort, you need to arrive early to secure the ride because each elephant has certain quota of rides per day. The Indian Government has limit the total number of journeys each elephant can do in a day in order to prevent over working for the elephants and possible animal cruelty. And I can tell you, Amer Fort is full of tourists coming from all over the world and the elephants normally finish their quota of rides by 11 am. 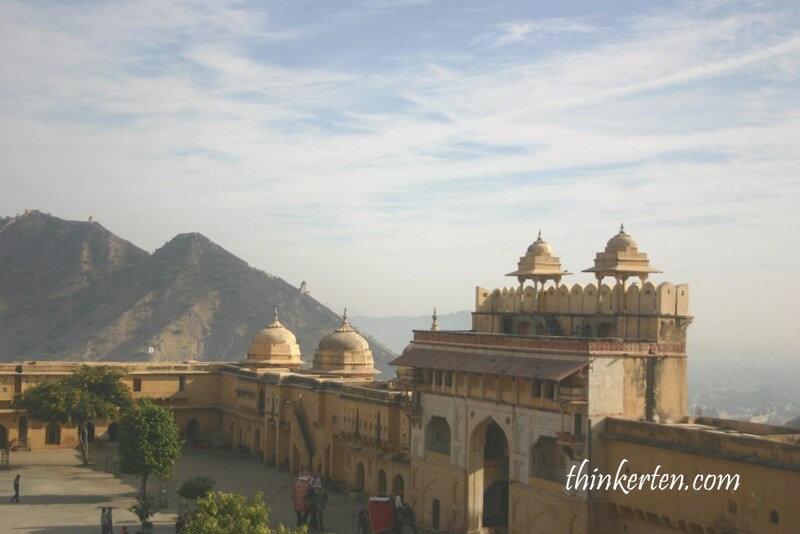 That is why I suggest you to come early to Amer Fort, else you have to walk all the way up hill by foot. It can be quite tiring because there is quite a distance to reach the top. I was lucky to secure the elephant ride and the elephant bring me uphill to the Amer Fort, making an entrance to the palace gateway like a royal family. How cool! The road uphill to the Amer Fort is quite hilly, hold tight to the elephant. The Amer Fort is a very big complex and it has 4 different courtyards to explore. I tried to cover as much as possible but I felt like there are still many more I have not explored because of time constraint. If you have any complaints and needs you need the King’s attention, come to this hall to speak with the King, the King meets all his public audience here. The beautiful hall stands on two rows of ornamented pillars and opens on three sides. Well, I have no complaints to the King. But something caught my attention and I quickly run to check out the stunning building. Pol means gateway or entrance. Ganesh is the Elephant God. 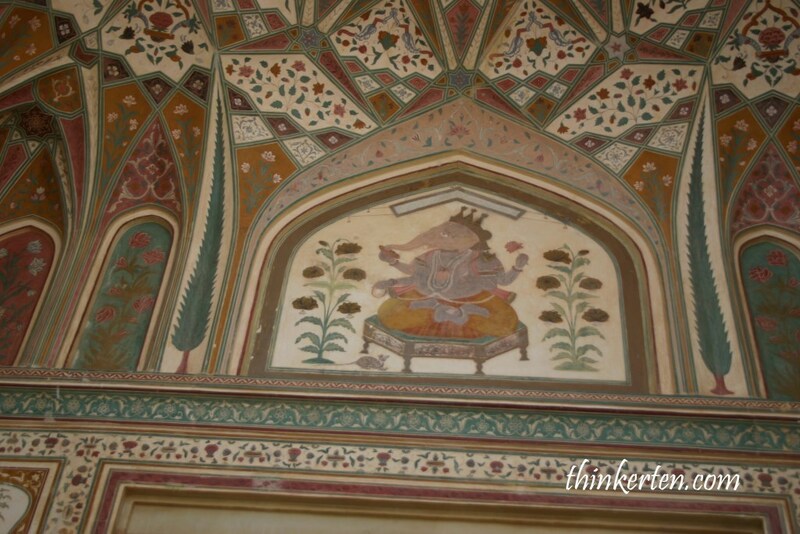 Ganesh Pol is my second favorite in Amer Fort. The elegant Ganesh Pol is named after the famous Hindu God, Lord Ganesha. This is the entry into the private palaces of the King. Observed the 3 little windows up the building, what are these tiny windows for? Lord Ganesh is one the the best known and most worshiped deities/God in India. The head is an elephant and has few hands. Lord Ganesh was painted at the top of the entrance, to help remove all obstacles. Can you believe natural vegetable dye was used to color the painting on the wall of Ganesh Pol and still retain it originality. When I climbed up to the top in Ganesh Pol, I notice there are three slightly bigger windows. These windows especially made for the curious loyal ladies to witness the public function in the courtyard as they are not allowed to show their faces in the public. Beside the three bigger windows, the wall is full of tiny holes where the Royal ladies and servants can check out the cutest guy in town when the King held his meetings in the Hall of Public Audience, which is just opposite of this building. I can actually see very clearly from these peeping windows. I noticed there are many Mahal in India and only realized later Mahal means Palace. 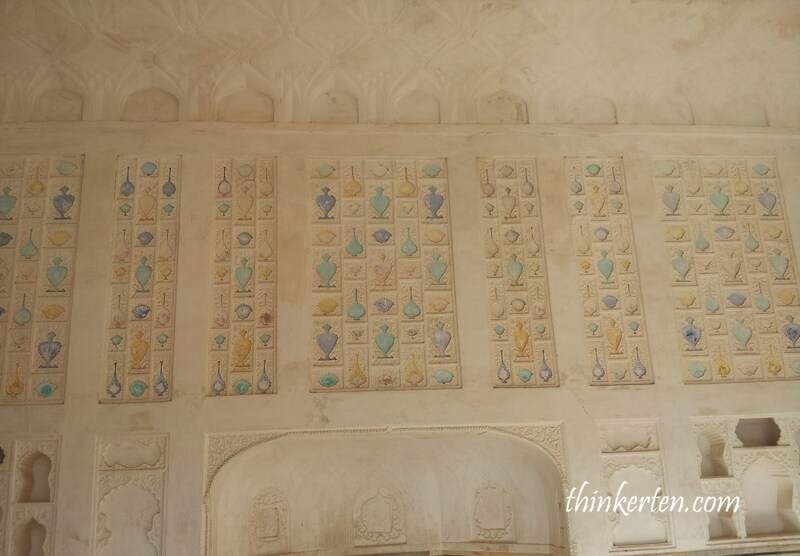 Sheesh Malah is one of the greatest of all in Amer Fort, it is also known as the Glass Palace. Once you entered the palace, the whole area is full of bling bling. This is my number one favorite in Amer Fort. 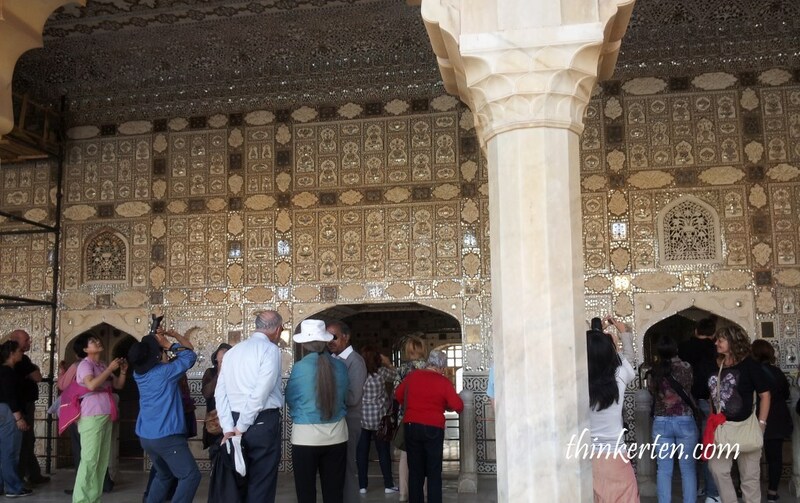 Why was the Sheesh Mahal built? The King built Sheesh Mahal for his beloved Queen, knowing the Queen love to look at the stars in the sky at night. Of course the King wouldn’t want his Queen to sleep outside to admire the stars. The whole building is embellished with glass and multi-mirrored ceiling. The mirrors are of convex shape and designed with colored foil and paint. Light a candle inside the Sheesh Mahal and the ceiling glows like a sky full of stars. The mirror are so carefully placed that the reflection is multiply a thousand times over! This is the most famous and most beautiful Mahal in Amer Fort. 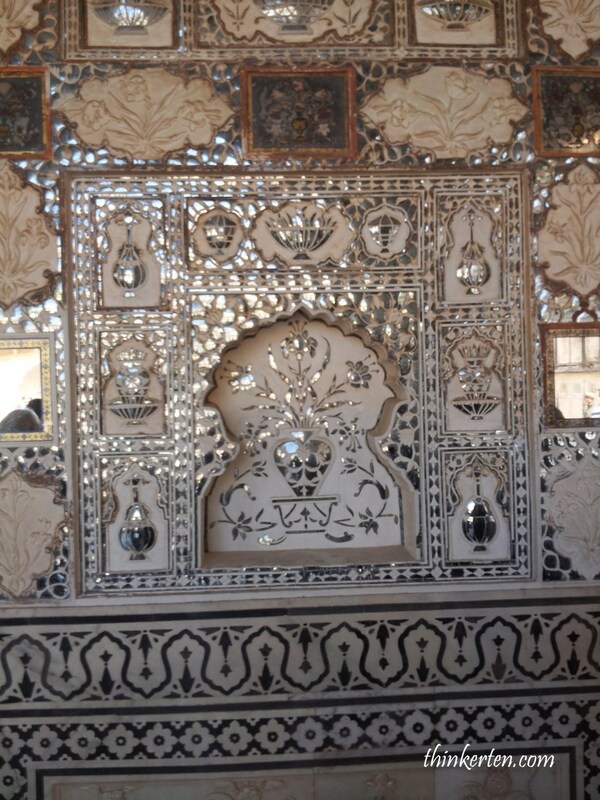 Remember to light up your lighter when in Sheesh Mahal to see the magic yourself, truly amazing effect. 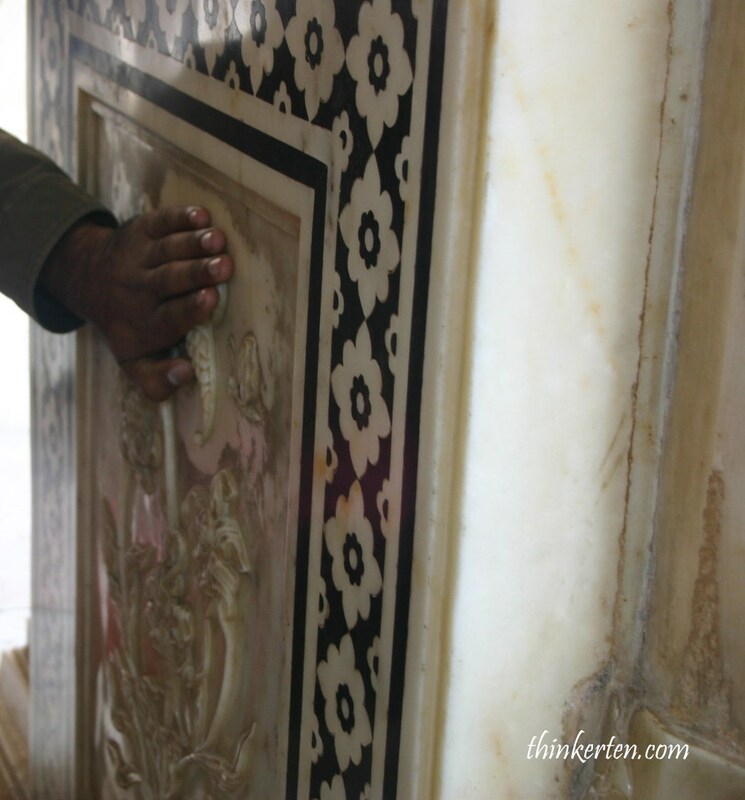 Sheesh Mahal has so many big and small mirrors where you could stand there and admire yourself for a while. 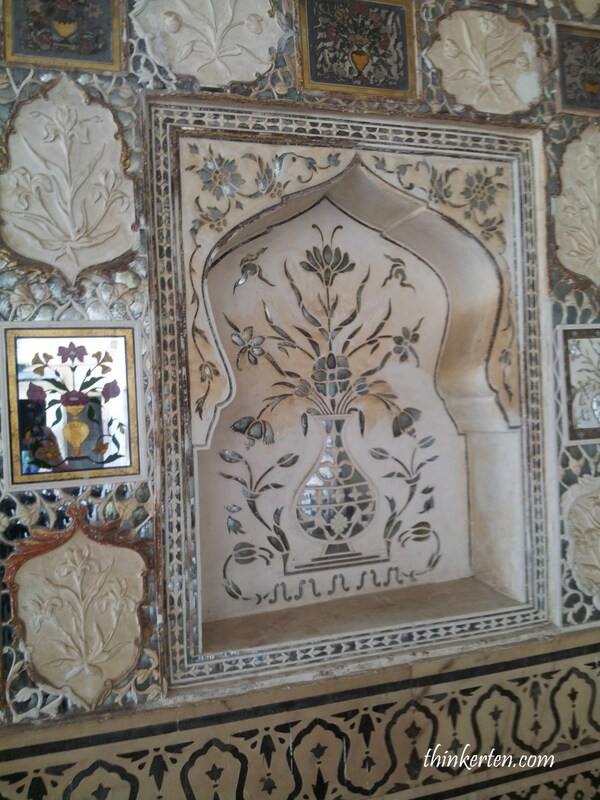 Go search for this magic flower located inside the Sheesh Mahal. It was beautifully crafted with marble. The flower has seven unique designs including a fish tail, lotus, hooded cobra, elephant truck, lion’s tail, cob of corn and scorpion, each one of which is visible by a special way of partially hiding the panel with the hands. Our Guide showed us as below. Spotted few Indian ladies wearing their striking yellow-orange sari which made a great photo shoots in Amer Fort. I believe they helped to clean the fort but was having a break and asking for money when tourists passed by. There are many local sellers selling small souvenirs such as t-shirts, pen, key chains and umbrella. 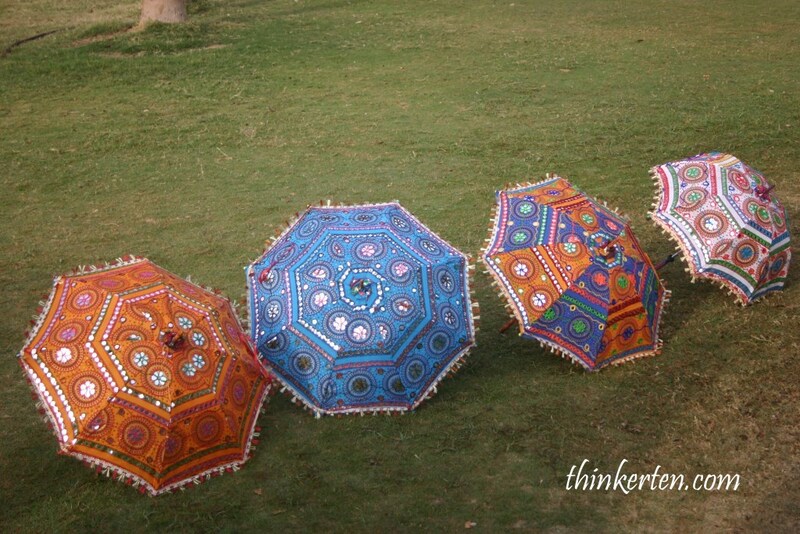 The asking prices for the umbrella was about USD 20 each at first but when I walked away, they reduced the price to few dollars. I end up buying a red color. This is the resting place for the King when he get tired during day time. The King used to spend time in this Sukh Niwa with his queen and concubines that is why it is also known as the “residence of pleasure”. 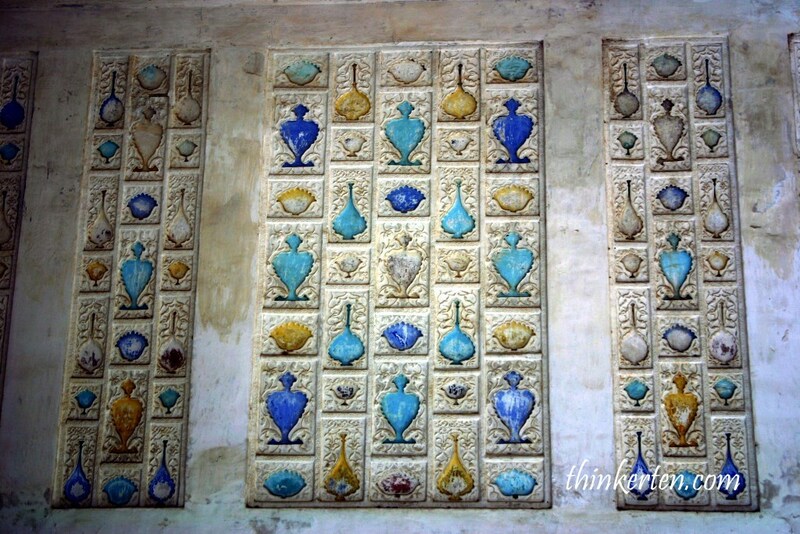 The entire palace is decorated with various type of vases crafted in the wall with light blue, deep blue and off green in colors. These colors are the cooling colors so by looking at these wall, the King would feel cooler when he rested here in the afternoon. 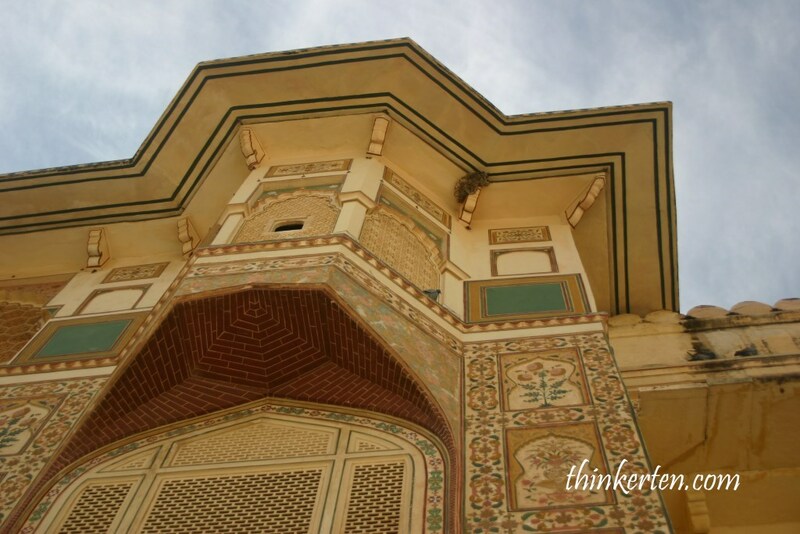 Sukh Niwas have doors made of sandal wood and ivory. There is a channel running through the hall, which carried cool water that worked as an air cooler. 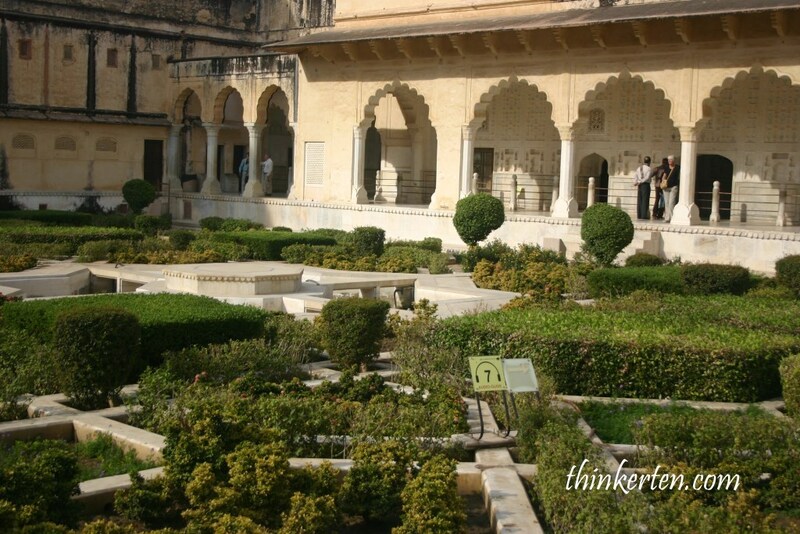 In olden day these water channels were used to flow of cold water to keep the palace cool during the summer time. 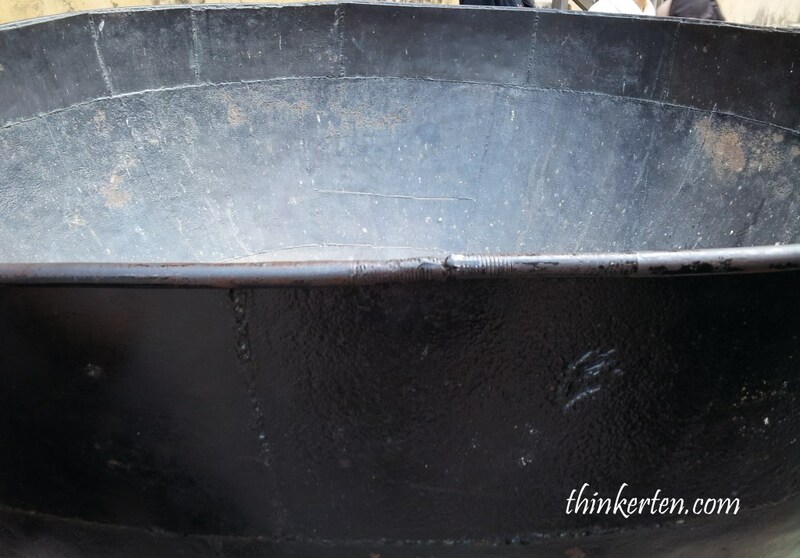 There is a Giant Wok in Amer Fort, it is not part of Amer Fort, it was left behind by the film maker of Jodha Akbar, a famous movie in India. The giant wok is so huge that it can fit up to 3 adults. Jal Mahal is beautifully located in the middle of Man Segar Lake in Jaipur city. 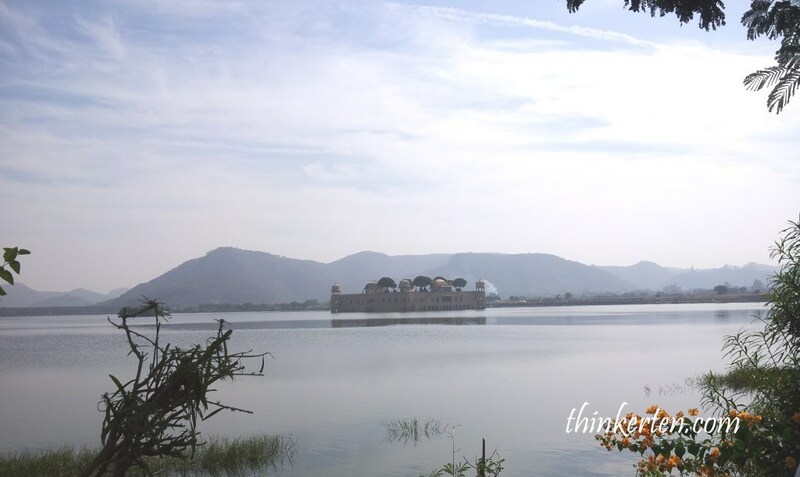 It is near Amer Fort, you could do the Amer Fort and Jal Mahal together in a day. I was disappointed to learn that you can only admire the Jal Mahal, water palace from afar as it is no longer allow to enter these days. This palace is a resting place and not a place to live for the royal family when they are out for duck hunting. The Jal Mahal has five floors but only the top floor can be seen above the water, the first four floors are submerged in water. Fishes can live in the first four floors. Happened to saw an Indian snake charmer blowing his musical instrument, pungi, while we were trying to cross a busy street in Jaipur city. Able to captured a picture both the snake and the Indian man. Hawa Mahal is also known as palace of wind because it is very windy place to live as there are many windows. 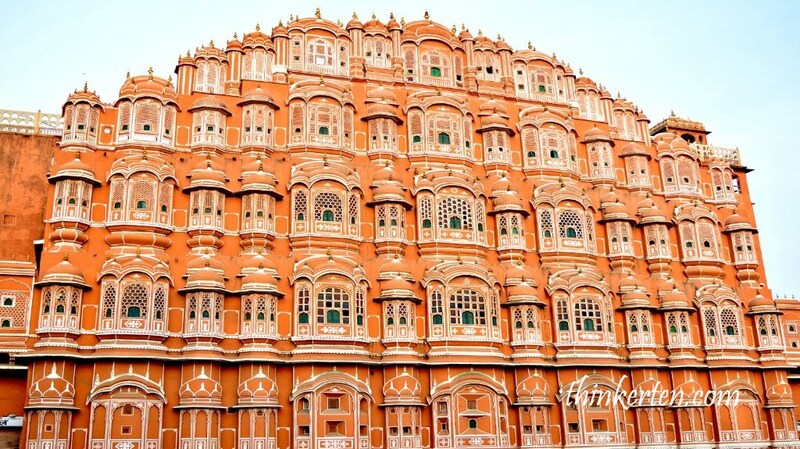 The iconic pink landmark in Jaipur look like a honeycomb, it is build with pink and red sandstone. Do you know how many windows in this palace? Total of number of windows big and small is 953, no wonder it is so airy and windy. With so many windows, it can then satisfy the curiosity of the royal ladies who were not allowed to show their appearance in the public. Behind these windows, the royal ladies can witness and peep freely what is happening at the outside world. Two purposes served, window for wind and peeping habit for the royal ladies! 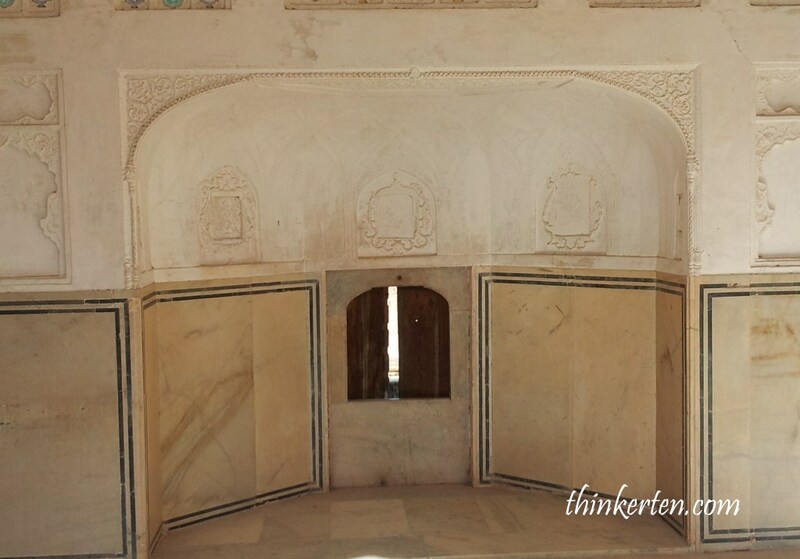 Why not join Jaipur Walking Tour? 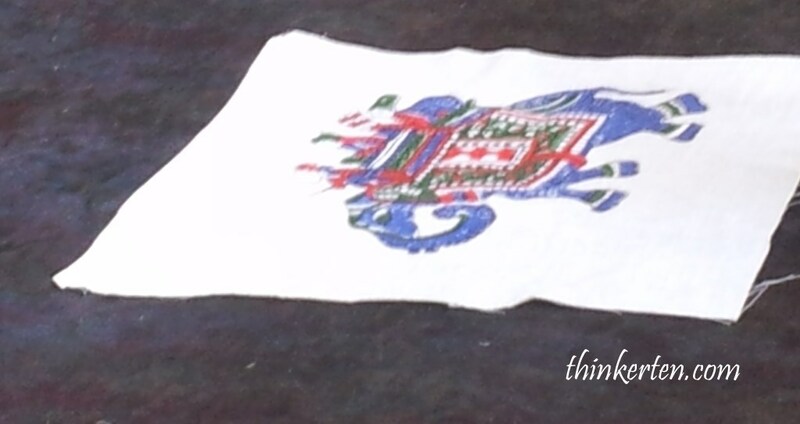 Coming to India, you have to visit their textile. My advise is see only, don’t buy as the textile factory normally charge quite high. 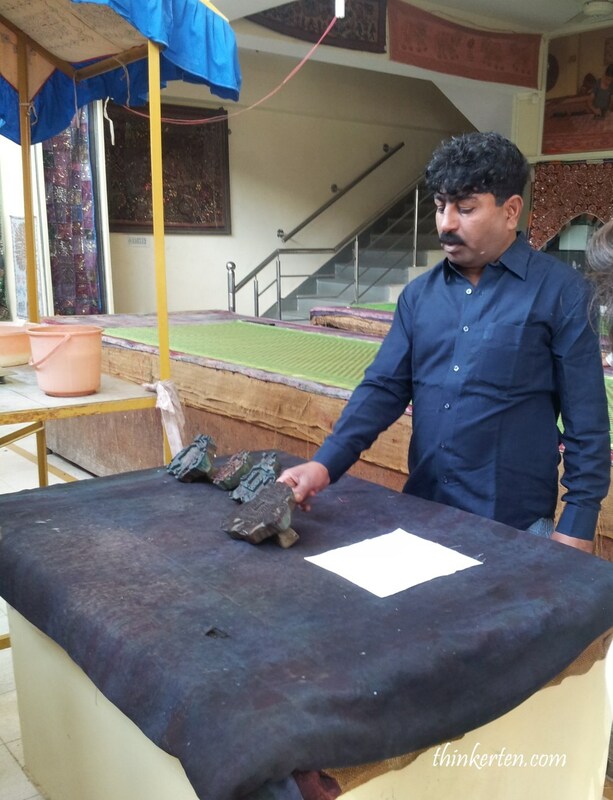 Before we enter, an Indian man showing us the mould for the printing. With only few second, an elephant was printed in the white cloth. I was lucky and gotten this elephant print from the Indian man as a souvenir. 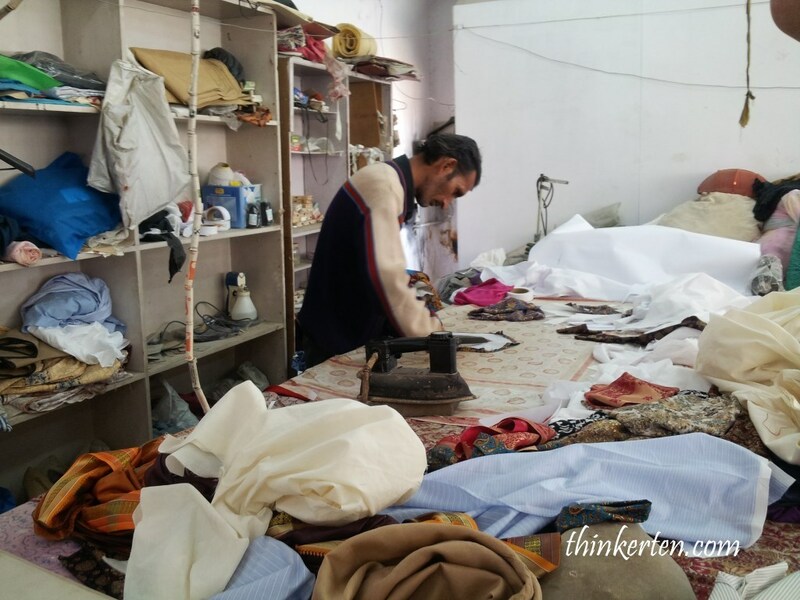 An Indian man was engrossed with his work at the messy workshop. Check out the old iron next to him, how antique! 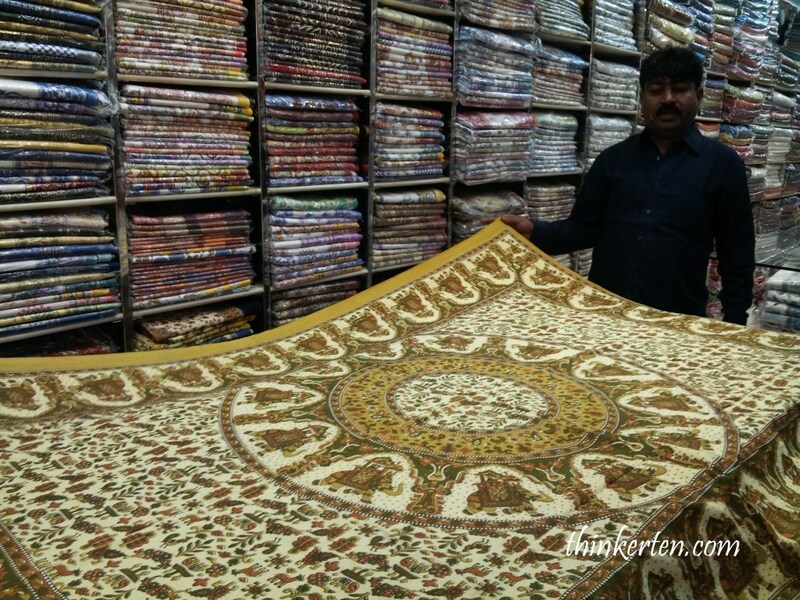 This salesperson was trying to sell me carpets but fail to persuade me to get one. I don’t have habit of keeping carpets at home so no point getting one. 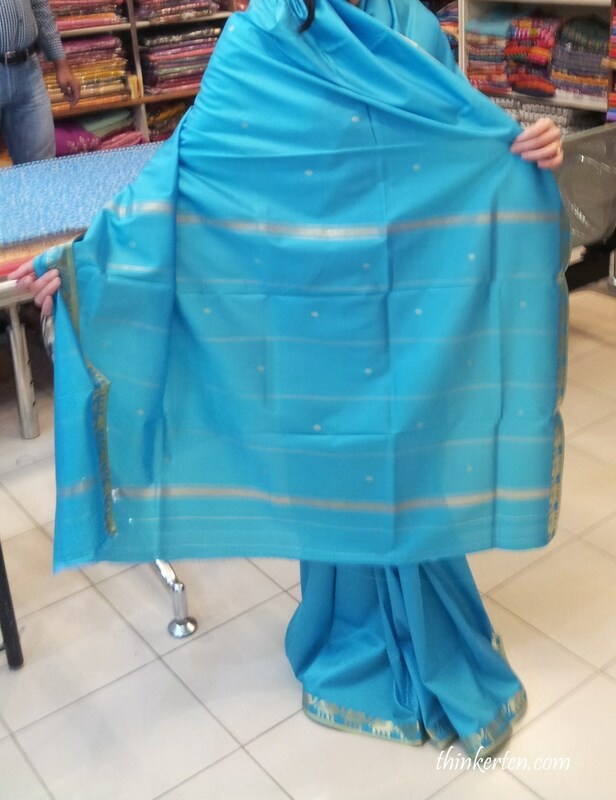 I tried a blue sari and being wrapped up like a blue mummy by two Indian men. Too hilarious! "Magic Flower" in Sheesh Mahal Amer FortAmer Fort or Amber FortAmer Fort reflection from Maota LakeBlue MummyDiwan-e-Aam at Amer Fort - Hall of Public AudienceElephant Ride up Amer Fort -what to watch out?Funky Umbrella sold in Amer FortGanesh Pol in Amer FortGarden outside Sukh Niwa in Amer FortGiant Wok in Amer FortHawa Mahal - Palace of WindIndia Golden TriangleIndian models in Amer FortJaipur cityJal Mahal - Water PalaceJodha Akbar movieLazeez Affaire Restaurant - Chinese Cuisine in DelhiLight a candle to see "Magic" in Sheesh Mahal at Amer FortLord Ganesh at Ganesh PolMountain view from the top of the Amer FortSnake charmer blowing his pungiSuhag Mandir in Ganesh Pol at Amer Fort - peeping windowsSukh Niwas in Amer Fort - check out the natural air-con systemTextile factory in JaipurVegetable Dye Painting in Ganesh Pol at Amer FortWhy was the Sheesh Mahal built?